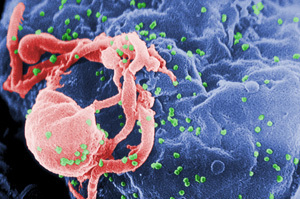 This image shows HIV-1 virus particles (green) budding from a cultured lymphocyte. Photo courtesy of CDC. The National Institute on Drug Abuse (NIDA) has awarded a $3.5 million grant for AIDS vaccine research to Phillip Berman, chair and Baskin Professor of biomolecular engineering at the Jack Baskin School of Engineering at the University of California, Santa Cruz. With the new five-year grant, Berman's group will follow up on promising findings they reported in the August issue of the Journal of Virology. The researchers identified a novel structural element in an HIV coat protein that could be useful for vaccine development. Despite major efforts over the past 20 years to develop an AIDS vaccine, none of the vaccines tested in clinical trials has succeeded in preventing HIV infections. Berman oversaw one of those trials as head of research and development at VaxGen. Now he has gone "back to the drawing board" to take a new approach to AIDS vaccine development. The focus of the research is on antibodies that are capable of neutralizing a wide range of HIV strains. Such "broadly neutralizing antibodies" are necessary to stop the virus because HIV is extremely variable, constantly evolving to evade the immune systems of infected individuals. "One of the main hypotheses in HIV vaccine research is that if a vaccine could induce those broadly neutralizing antibodies, it would work. None of the current vaccines do that," Berman said. Our immune systems are capable of making broadly neutralizing antibodies against HIV, but studies have found that this happens in fewer than 25 percent of infected individuals and not until six to 12 months after infection. By then, it's too late to stop the virus. "The antibodies have to be there before infection occurs. After the virus gets a foothold, it's too late," Berman said. Berman's lab, along with collaborators at Monogram Biosciences of South San Francisco, developed a new method called "swarm analysis" to investigate the natural variations in the virus that emerge in the early stages of HIV infections. The studies reported in the Journal of Virology paper were led by first author Sara O'Rourke, a research specialist in biomolecular engineering at UCSC. "We've made use of the natural variation in viral gene sequences to identify the binding sites recognized by broadly neutralizing antibodies," Berman said. "By looking at viruses from very early infections, we're seeing variations that hadn't been seen before." One of those variations appears to change the shape of an HIV coat protein in such a way that it becomes more sensitive to neutralization by antibodies. Working with William Scott, professor of chemistry and biochemistry at UCSC, Berman's lab analyzed the effects of this genetic variant on the three-dimensional structure of the protein. The results indicate that the structural change exposes parts of the protein that are normally hidden from the immune system and are only exposed transiently during the infection process, when the viral membrane fuses with the membrane of a human cell. In the Journal of Virology paper, the authors suggest that this novel structural variant could be exploited in designing new vaccines. "We think that by making a vaccine based on this structure where the binding sites are exposed, it will stimulate a broadly neutralizing antibody response," Berman said. "By having the protein in a different conformation, the immune system can see those binding sites and make antibodies that would then be effective against normal virus strains during that transient window when the sites are exposed." Studies are currently under way to examine the immunogenic potential of the variants identified in the study. Meanwhile, the vaccine that Berman invented at Genentech in the mid-1990s, then evaluated in clinical trials at VaxGen, has been tested in a more recent clinical trial (RV 144) sponsored by U.S. and Thai government agencies. The manufacturing and intellectual property rights for the vaccine are now held by Global Solutions for Infectious Diseases (GSID). Results of the trial, which concluded earlier this year, are expected to be announced in October at the AIDS Vaccine 2009 international conference in Paris. The clinical trial tested a "prime-boost" vaccine regimen, in which a vaccine developed by Aventis Pasteur was used as a "priming" vaccine, followed by the GSID vaccine as a "booster." The community-based clinical trial involved 16,000 volunteers in southeast Thailand. Berman said the research funded by the new grant will complement the data from the RV 144 trial. Using the "swarm analysis" technique and the bioinformatics and genomics expertise of his UCSC colleagues, Berman's group will be studying the evolution of the virus and the host's immune response during the early stages of HIV infection. Blood serum samples collected during earlier VaxGen clinical trials involving intravenous drug users are a crucial resource for these studies. "It's a lemons to lemonade kind of thing, building on information from a failed vaccine trial to move the field forward in a different way," Berman said. In addition to O'Rourke, Berman, and Scott, the coauthors of the Journal of Virology paper include Becky Schweighardt and Terri Wrin of Monogram Biosciences, Dora Fonseca of UCSC, and Faruk Sinangil of GSID. GSID is a nonprofit organization based in South San Francisco that focuses on vaccines for the developing world. The study was supported by a grant to GSID from the Bill and Melinda Gates Foundation and funding provided by UCSC.